This Stage 5 modular building extends over 800m2 and includes a 100m2 covered external patio area. The building was specifically designed to cater for the special needs of young adults aged 16 – 19. 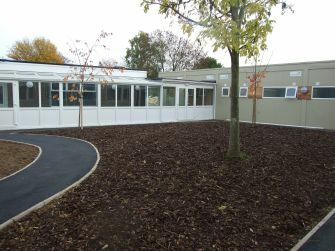 In order to incorporate a sustainable and accessible deign Extraspace Solutions included Sensory rooms, PMLD (Profound & Multiple Learning Difficulties) & SLD(Severe Learning Difficulties) Classrooms, Ceiling mounted personnel hoists have in PMLD Classrooms and the fully fitted out wet room/accessible bathroom, bright and spacious corridor area’s and ramped access routes to the building. The structure has been future-proofed to allow for the increase in use of such mechanisms, as well as a second floor at a later stage. The new KS5 building is linked to the existing school via a 15m fully glazed link corridor which allows all pupils and staff free and easy access to the new facility.